Not the most famous or visited state in the union, but it is all the better for it. Serious serenity and outstanding landscapes are on offer here, as well as the hip city of Portland. OK, so we cheated a little by bolting on two Californian National Parks but don’t tell anyone. Shhh. In recent years Portland has become one of the coolest places to visit in the US. Hipster vibes, cool coffee joints and tax-free shopping make for an enticing offer for people looking for the next big thing. Pioneer Square in the heart of the city is a great place to start. Did we mention the tax-free shopping yet? Downtown Portland offers major labels and department stores like Nordstrom. In Pioneer Place, you’ll find top brands like Apple, Louis Vuitton and many more. Be sure to visit the Pearl District too for art galleries, interior design stores and trendy boutiques. A second full day to explore Portland. Nature lovers may wish to check out The Japanese Gardens, Rose Test Gardens and Oregon Zoo. These three tourist treats all lie within Washington Park on the western edge of the city. Collect your car and take the short drive along Sunset Highway to find lovely Cannon Beach. This charming town sits in a prime spot next to Haystack Rock on the epic Oregon Coastline. Rent a bike, stroll around the shops and adorable homes or just enjoy some quality time on the beach. Feeling more active? Nearby Ecola State Park offers great hikes and awesome vista points for you to enjoy. Some of the classic 80s film “The Goonies” was filmed within this amazing State Park. Cruise south on the 101, stopping at the points of interest and places of outstanding beauty which will be listed in you personalised Road Trip Pack. Massive sandstone boulders look like they have been dropped from the heavens along this stretch of coastline. Rugged, wild and wind-swept Oregon’s beauty is up with the best of them. Continue to cruise south down the awe-inspiring Route 101 and explore nature's artistry at work, driving through forests, state parks and coastal areas often decorated with mist. Redwoods once common throughout North America are now only found in Oregon and California. For the ultimate Sequoia experience, head to the Redwood National Park in northern coastal California. These are true giants at up to 100m high and 11m in diameter. Once you've stood amongst these trees, the stresses of work and home life will just melt away. There are 7 separate parks to visit in this area, so a second full day in Redwood National Park is a must in our opinion. Your road trip travel pack will give you loads more detail to help you decide how to prioritise your time. Right at the top of California lies Mount Shasta, early west coast explorer John Muir wrote: "When I first caught sight of it I was 50 miles away and afoot, alone and weary. Yet all my blood turned to wine, and I have not been weary since." As John Muir got closer he would have seen sparkling lakes and emerald green forests. Our recommended route takes you via the historic town of Jacksonville en-route. Stop by for a nice lunch and to take advantage of the numerous photo opportunities this charming town offers up. After lunch, you’ll cruise north along scenic OR-62 towards one of America’s true wonders - Crater Lake National Park. Crater Lake is the deepest lake in the United States. Rising from a dormant volcano the lake is the major draw to this wonderful National Park. Crater Lake National Park has inspired people for hundreds of years. No place else on earth combines a deep, pure lake, so blue in colour; sheer surrounding cliffs, almost two thousand feet high; two picturesque islands; and a violent volcanic past. It is a place of immeasurable beauty, and an outstanding outdoor laboratory and classroom. Your final stop awaits. Cruise north to imposing Mount Hood and the epic Columbia River Gorge. Along the way, you’ll pass more stunning scenery including Newberry National Volcanic Monument and Smith Rock State Park. Mount Hood is the highest point in Oregon, not so much a mountain as an active volcano and one of the crown jewels of Oregon. Within the Columbia River Gorge, we highly recommend visiting Multnomah Falls and the Bonneville Dam. The following day you’ll return to nearby Portland to fly home after two amazing weeks spent discovering Oregon and northern California. 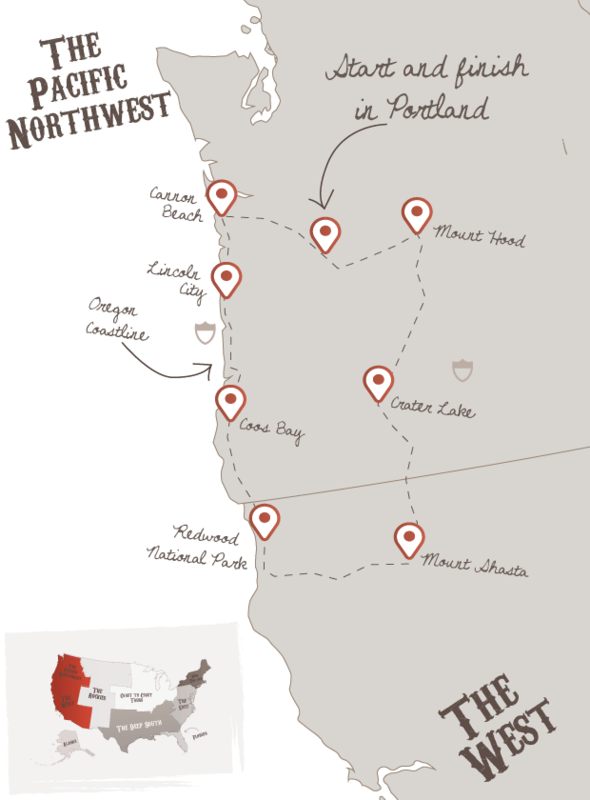 Don't forget to check out this road trip's Itinerary tab to see more amazing pictures from our 'Discover Oregon' tour. You'll also be able to read a little bit about what you'll be getting up to on each day of this incredible road trip adventure.